Adding colour in the kitchen has never been easier than with the new Pantone Coffee Maker. These percolating pots are made from solid aluminium, hold nine cups of espresso, and are available in two glossy Pantone colours. 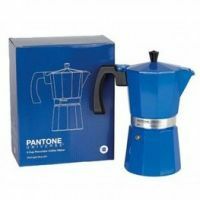 The Pantone stove top Coffee Maker is the perfect gift for coffee lovers this Christmas. Or simply get one for your own home or office.